During the early European settlement period, Milwaukee was one of several fur trading posts along the western Great Lakes. Wisconsin’s fur trade originated in the second half of the seventeenth century when the French exchanged various small but useful items for peltry and foodstuffs from indigenous men and women. By the mid-1700s, fur trading had become a fixture of white-Indian interactions in New France. Although the British established a presence after 1763, French-Canadians continued to command the most valuable contacts with local Indians until after 1815, due largely to kinship connections established with tribes through intermarriage. Trading routes loosely followed the indigenous trade routes traveled by explorer Louis Joliet and missionary Jacques Marquette in 1673-74, with posts located at Mackinac, Green Bay, Portage, Prairie du Chien, Peoria, Joliet, Chicago, and Milwaukee. The French granted monopolies at these posts until 1763, after which the English operated the trade via free-enterprise. The Northwest Fur Company was one of the earliest British agencies operating in Wisconsin, followed by the American Fur Company established in 1808. Numerous tribes throughout present-day Wisconsin were involved in this trade, including the Saques, Foxes, Ojibwe, Dakota, Menomonies, Ottowas, Ho-Chunk, and Potawatomis. Fur traders worked in conjunction with engagés. Whereas traders provided capital, licenses, and connections with established companies, engagés (or voyageurs) traveled to interior outposts, making exchanges with Indians and transporting their valuable cargo back to the trading centers. Wisconsin’s many inland waterways made the area ideal for fur trading, allowing voyageurs to travel up to fourteen hours per day and hundreds of miles by canoe each season. The native peoples hunted and trapped animals, such as beavers, bartering some of their pelts for European commodities such as colored cloth, tobacco, needles, and knives. Women also exchanged such goods for their agricultural surpluses to feed the traders and their employees. Over time, as white settlement increased and the timber and mining industries began to operate, the fur trade declined amid wide-ranging impacts on the environment and the lives of indigenous peoples in Wisconsin. Native spiritual and cultural patterns were disrupted and intertribal conflict worsened as groups competed for trade relationships. Milwaukee, situated far from primary posts at Green Bay and Mackinac, remained a secondary location until after the American Revolution. Beginning in the 1780s and 1790s, Milwaukee-area traders started appearing on company rosters, and the 1795 arrival of Jacques Vieau signaled a new era of economic importance for the small outpost. Vieau married Angelique Roy, a granddaughter of Potowatomi chief Anaugesa, and assured the stability of his post. He spent nearly forty years as a trader in the Lake Michigan region and established the “Milwaukie Outfit,” under the American Fur Company. Throughout the 1790s he was joined by a growing number of French-Canadian traders who helped make Milwaukee an important anchor in a chain of posts along the shore of western Lake Michigan, including Kewaunee, Sheboygan, and Manitowoc. 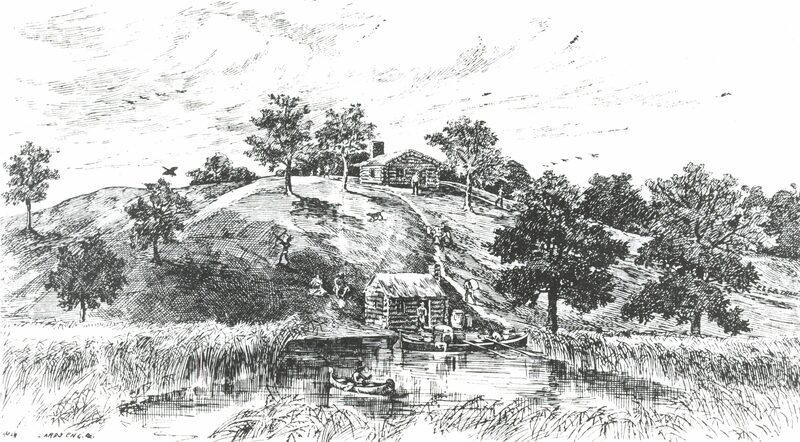 Milwaukee’s trading community settled along the main river and, like most early settlements, consisted largely of unlicensed, independent individuals. In 1818, Solomon Juneau arrived in town, working as a clerk for Jacques Vieau. He became the American Fur Company’s local agent around the same time that he married Vieau’s daughter Josette. Working closely with local tribes such as the Menomonee and Potawatomi, Juneau remained a prominent figure in the region’s fur trade until it began to wane in the 1830s. Relocated Indian populations, some deforestation, changing fashions, and westward settlement all contributed to the demise of the traditional fur trade in Milwaukee by the end of the 1840s. ^ This entry was first posted to the Encyclopedia of Milwaukee website on September 19, 2017. This revised version was posted on March 7, 2019. The Encyclopedia of Milwaukee is grateful to Cary Miller and Susan Wade for their assistance with this entry. ^ Bayrd Still, Milwaukee: The History of a City (Madison, WI: The State Historical Society of Wisconsin, 1948), 3-4; Frederick I. Olson, “City Expansion and Suburban Spread: Settlements and Governments in Milwaukee County,” in Trading Post to Metropolis: Milwaukee County’s First 150 Years, ed. Ralph M. Aderman (Milwaukee: Milwaukee County Historical Society, 1987), 2; Gary Anderson, Kinsmen of Another Kind: Dakota-White Relations in the Upper Mississippi Valley 1650-1862 (Lincoln, NE: University of Nebraska Press, 1984); Sylvia Van Kirk, Many Tender Ties: Women in the Fur-Trading Society in Western Canada, 1670-1870 (Winnipeg, Manitoba: Watson and Dwyer, 1980); Susan Sleeper-Smith, Indian Women and French Men: Rethinking Cultural Encounter in the Western Great Lakes (Boston, MA: University of Massachusetts Press, 2001). ^ John Gurda, The Making of Milwaukee (Milwaukee: Milwaukee County Historical Society, 1999), 5-6; Still, Milwaukee, 5-6; Richard White The Middle Ground: Indians, Empires, and Republics in the Great Lakes Region 1650-1815 (Cambridge and New York: Cambridge University Press, 1991). ^ Still, Milwaukee, 4-5; Gurda, Making of Milwaukee, 15; Les and Jeanne Rentmeester The Wisconsin Fur-Trade People ([Wisconsin? ]: L. &J. Rentemeester, 1991), 1, 12. ^ Gurda, Making of Milwaukee 10; Sleeper-Smith, Indian Women and French Men; Cary Miller Ogimaag: Anishinaabeg Leadership, 1763-1845 (Lincoln, NE: University of Nebraska Press, 2010); Bruce White, “The Woman Who Married a Beaver: Trade Patterns and Gender Roles in the Ojibwa Fur Trade” Ethnohistory 46, no. 1 (1999): 109-147; Lucy Eldersveld Murphy, A Gathering of Rivers: Indians, Metis, and Mining in the Western Great Lakes, 1737-1832 (Lincoln, NE: University of Nebraska Press, 2000). ^ Gurda, Making of Milwaukee, 6, 12-16. ^ Gurda, Making of Milwaukee, 13, 17-20; Still, Milwaukee, 5; Olson, “City Expansion and Suburban Spread,” 10. Murphy, Lucy Eldersveld. A Gathering of Rivers: Indians, Metis, and Mining in the Western Great Lakes, 1737-1832. Lincoln, NE: University of Nebraska Press, 2000. Sleeper-Smith, Susan. Indian Women and French Men: Rethinking Cultural Encounter in the Western Great Lakes. Boston, MA: University of Massachusetts Press, 2001. Van Kirk, Sylvia. Many Tender Ties: Women in the Fur-Trading Society in Western Canada, 1670-1870. Winnipeg, Manitoba: Watson and Dwyer, 1980. White, Bruce. “The Woman Who Married a Beaver: Trade Patterns and Gender Roles in the Ojibwa Fur Trade” Ethnohistory 46, no. 1 (1999): 109-147.